I saw her on Facebook and I'm very impressed. Lucas Leaf Creations owned by April Lucas. She's a unique artist. A wife and a stay-at-home mom of 2, one 9-year-old daughter and 7-year-old boy. 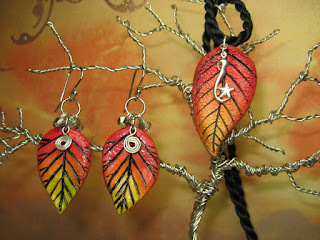 What impressed me the most is that she used a leaf for her creations. Yes, you heard it right. It's a leaf, a part of nature. According to her, "It is wonderful preserving the life of leaves that fade away, never see it again. I love that the leaves I choose live on forever". All her creations are one of a kind, handmade and "a kind imprints of nature being that the leaf is no longer usable after it has been cast". Above is one example of her creations that I love. Isn't it wonderful? And to my imagination, "you look like a fairy with that awesome thing!". If you want to see more of her creations, you can find and like her on Facebook: Lucas Leaf Creations or her Etsy Shop. This is not a sponsored post! It is posted for my admiration of her creations.